Meg Squats is such a great ambassador for the lifting life, it can be easy to forget that she's not just somebody who does it for fun (although, to be clear, she does seem to enjoy it more than almost anyone else out there). In addition to being the 2018 Bodybuilding.com Spokesmodel Search women's winner, Meg is also a competitive powerlifter, and as such, her training year is anchored around some non-debatable events. Foremost among them is the USAPL Raw Nationals, which Meg will compete in for the fourth time this weekend. Just over a week out from the competition, this bourgeoning star in the world of strength talked with Bodybuilding.com about her prep—which heavily involved her popular Bodybuilding.com All Access program Uplifted: Build Muscle and Strength with Meg Squats—and how this prep has dovetailed with changes in her life, training, and overall strength. This interview has been edited for length and clarity. You can hear the full version on The Bodybuilding.com Podcast. Bodybuilding.com: This is a meet you've done multiple times. Is it basically what your training year hinges around at this point? Meg: Yeah, definitely. The past two years, this has been the only meet that I've done, and it's almost the one thing that I do in the year that I'm really focused on. I'm always focused on getting stronger, but I guess this specific date is the opportunity that I get to actually express the strength that I've built, over a full year. It's nice to do it on a bigger stage, and this is the frequency of competition that doesn't drive me crazy and keeps me coming back every year. You mentioned in a recent video that you're super focused and "going HAM sandwich" right now. Some people may think that sounds stressful, but you almost sounded relieved to have a sense of purpose, and like it felt great to be able to say no to things. It definitely does, because I know that it's not what my life is going to look like forever. Buckling down is kind of this relaxing thing where I just made a choice, and I just honor the choice that I made to compete. It's kind of easy to say no to things when you're focused. Or maybe it's not saying a complete no, but it's like, "Hold on. Hold that thought, and I'll be back after October 12th, and then we could do it." At this point in your career, how important is that number on the platform to you? Is it just another data point, or does it mean more now that you have all this experience behind you? It's more important to me, but my approach is more relaxed, if that makes sense. I show up to the same meet every year. I know what to expect, and I'm more comfortable with the choices that I make leading up to it, and because I know what choices are the right ones to make. But the competition overall is more competitive, as opposed to the first time that I competed in it. Powerlifting, over the past four years, has just really exploded, and I'm proud of that, and that's exactly what I wanted to happen. So it's great, but for the athlete in me, it's made it so that it's really hard for me to break into like the top 10. Now, it's like, "OK, I'm spending all this time. I hope that I am strong enough to get back in the top 10." That would be great. I'd be really, really proud of that. In one of your recent videos you said, "I've never felt so good in a prep." But you've also been nailing PRs and hitting all your reps. Does feeling good freak you out at all? Like, "This should feel worse. My body should hate this." It does freak me out a little bit. But honestly, I probably wouldn't keep powerlifting if I always felt the way I've felt in the other meets. I guess it's like I'm in unknown territory. But, I think I'd be foolish to think that were a bad thing. Consistent heavy lifting is often its own special type of fatigue, though. What do you recommend to lifters who are struggling with that fatigue, perhaps in a program like Uplifted? Yeah, I think some of the biggest things to remember are to follow the program that is written out for you. People start getting strong, and they get so excited, and then they want to keep pushing that strength, forgetting that there's a program written so you can follow it. If you're starting to notice that the plan set for you is too much and you can't recover, first try to eat more or sleep more. And then if that doesn't work, instead of introducing all these crazy recovery methods or doing anything too expensive, like getting massages or cryotherapy, drop the volume a little bit. Start with the least specific movements that you have—the "bro stuff"—and take some of those out, and then go up to your main movements. See how your body responds to that drop in volume. If you're not recovering then, check on the volume, check on your sleep, and check on your nutrition. Whey protein is the most important weapon in your muscle-building arsenal. It promotes muscle growth, counteracts muscle breakdown, and supports your workout recovery. Our protein blends 3 types of whey for ultimate muscle growth and recovery. You recently posted a video of a prep PR in the deadlift. One thing that I really admire about you, and I think other lifters do as well, is the patience that you have with those reps. I usually joke and tell people, "Just close your eyes and count to 10 and then it'll eventually leave the floor." That really is it! It just takes time, because I'm pulling something very heavy, but I know in my head that it's like, "OK, stay with this, because the more disciplined you are off the floor, the more consistent you'll be with the pull, and then you'll be in the right position to make the rest of the pull easier." The second you let your body get out of position, and the second you think "Whatever! I'm just going to rip it off," that's when the pull becomes even harder, not only through the initial start, but also through the rest of the rep. But anytime I'm handling a lifter, I also always remind them like, "OK, whatever that weight is, we chose to put it on that bar for a reason. So, you'd better pull it off the ground. Don't stop pulling if it feels heavy. It's heavy because it is. But just know that you're stronger, and you can lift that." 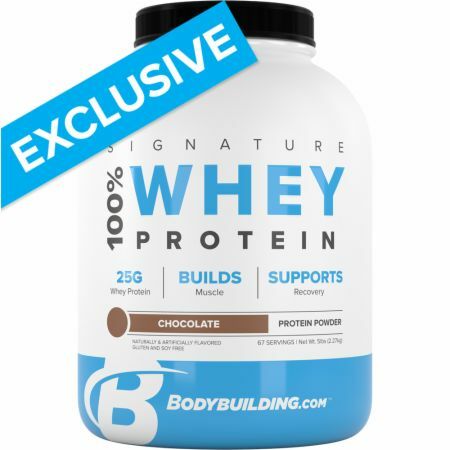 You mentioned in a recent video that you're way into the new Bodybuilding.com Signature protein bar. I've been sampling these as well. And I had to ask, does that mean the Rice Krispies Treat and protein shake combo is no longer part of your workout routine? Oh, man. You can't make me choose! I'll still have both the Krispies and the bars. Those things are so good. But I like to have the bars as a snack throughout the day, in case I don't want to cook or I need something quick. My nutrition plan has me spacing out my protein evenly throughout the day, so having a snack that's like 20 grams of carbs, 20 grams of protein, it's just a straightforward small meal for me. What role did your Bodybuilding.com All Access program Uplifted: Build Muscle and Strength with Meg Squats play in your prep? Uplifted is what I ran in my off-season, after I took some time off after my last meet, and it was time to get back on a consistent, focused program. It was a way to do a lot of bodybuilding stuff while still getting back into the squat, bench, and deadlift. That program was what I accredit some of the muscle gain that I made in the off-season. I think I ran 16 weeks of Uplifted. In the second eight weeks, we made some minor adjustments. Overall, it's a program that can be run by someone like me who's getting ready for a meet. But some of the transformations that I've been reading online are from beginner lifters and general lifters, not just off-season powerlifters. So, it's been really exciting to be confident in my own progress, but to also see other people who run it. I've seen in-depth reviews of the program on Reddit, to see how someone's fat percentage has changed, to see how much stronger they've gotten. People ask me all the time, "Oh, what do I do next?" And I'm like, "Uh, if it works, then you should just run it again." That's a good point. A lot of people just approach the end of a program like, "OK, I did it, I'm done." But it's totally an underappreciated tact to say, "Alright, I'm going to do it again, and be better and more confident the next time around." Yep, and now that your numbers have changed, and you're stronger after the first eight weeks, it is a different program! Because one, you're better, and two, the weights are going to be heavier, because we calculate them off of percentages and RPE. So, you're going be more in tune with what your "rate of perceived exertion" is, and you'll just know how to run it even more efficiently. And there are a lot of movements in that program, too. So I don't think there's any fear of boredom in it. If anything, it's even better for you to get more in the habit of squatting, benching, and deadlifting, because you're just going to get better with more practice. One thing I like about your Uplifted program is that it treats building muscle and strength as the same project, not different projects. For sure. I mean, I think if you want to be a good powerlifter, increasing the amount of muscle mass is where you want to be, and then it's just practicing the main powerlifts and getting a lot of volume of those lifts in the program. That's why Uplifted is such a great option, because it combines both of those worlds to make it so that someone is in the habit of training hard so that you're really building a bigger powerlifting total, and also a healthy and well-rounded physique to support that strength. Huge muscles is always the plan.